This page is dedicated to our fellow brothers and sister. While these loved ones are no longer with us they remain in our memories and are therefore everlasting and eternal. With respect to the families not all members are listed here at the request of the families. 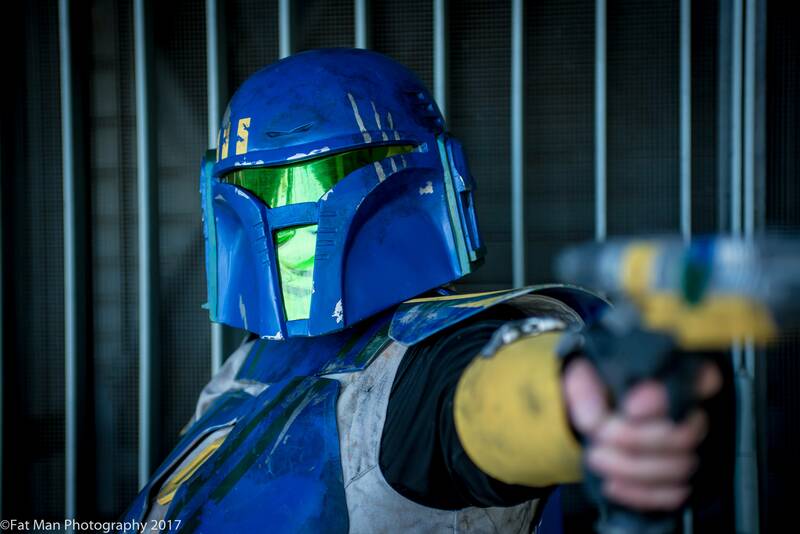 If you are a family member and would like a member added or removed please contact comms@mandalorianmercs.com. At 2am EST this morning, retired Naast Clan member Kessler Jackson (Bawi Sedia) lost his life in a car accident. Kessler was one of the founding members of Naast Clan, and I personally had the honor of first meeting him at DragonCon 2007. He was always the life of the party, and outspoken on the things he felt strongly about. He enjoyed trooping and did many events with Naast Clan over the years including DragonCon and AdventureCon. My first memory of Bawi was meeting him in the Marriott at DragonCon 2007, standing at the tables near the coffee shop in his silver mando armor. He marched with us in the parade, and joined us for the group shot. By the end of the convention, he was determined to become a Mercs member. 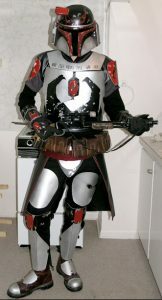 In 2009 he upgraded his armor to a blue and black set, and would troop with Naast Clan until the end of 2010 when he retired from Mercs for personal reasons. In keeping with Mandalorian tradition, we will be placing Kessler's character "Bawi Sedia" on a remembrance list to honor his membership and service to Mercs during his time as an Official Member. "Ni su’cuyi, gar kyr’adyc, ni partayli, gar darasuum"
"I'm still alive, but you are dead. I remember you, so you are eternal." Chris Brown, aka Remo Jadd, lived and breathed the Mercs. He was always found helping others on the forums and giving positive and constructive criticism for anyone who would ask. 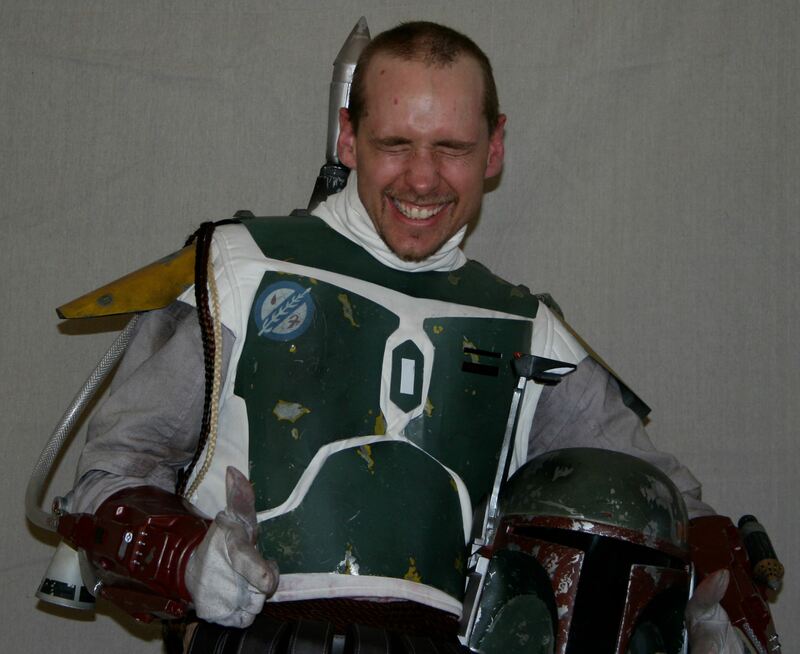 His knowledge and expertise saw him become the Vok'chi clan Ruus'alor and member of the Applications team. His sterling work meant that he served on the MMCC Council as Applications Officer. Remo was a highly respected member of the club and his loss is still felt today. 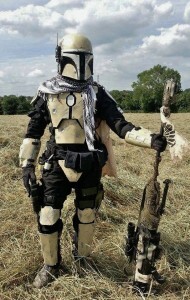 Pogo was a highly regarded unofficial member of the Vok'Chi clan who was on the verge of becoming an official member of the Mandalorian Mercs at the time of his passing. He was a very enthusiastic and committed member of the Mercs and was granted official member status by the club as a posthumous honour. 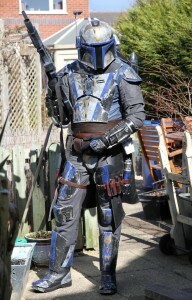 A quote from Baytrooper: "Every time I put this kit on, I think to myself how privileged I am to wear it. Before I go out to troop in it, I say to myself "Let's go Mate". 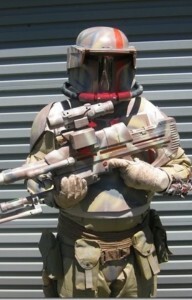 I keep the special "Sniper" patch in a pocket on the flight suit always and wear the Mando with pride. It is an honour to continue to share this with the world. " She was a pillar in the Cosplay Community in Salt Lake City Utah, and was friends with Mercs and Costumers all across the USA. She attended many Cons, but loved Dragon Con and Salt Lake Comic Con. She was a loved member of the Gears of War 26th RTI Group. And she was working on her set of Mandalorian Armor, and was getting rather close. 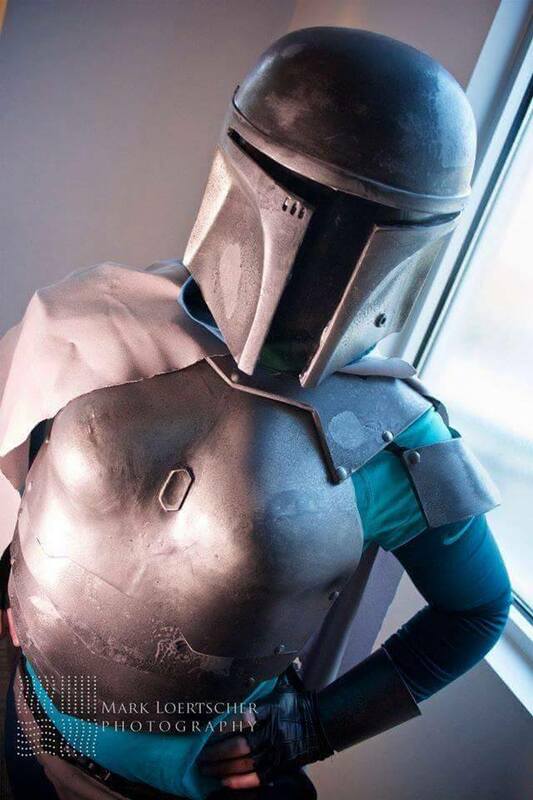 She trooped a few times alongside several members of Krayt Clan. She had an absolutely contagious passion for Costuming and all things nerdy, but mostly for the friends that she made in our little community. She will be remembered most for her positive "Can Do" attitude and her willingness to befriend everyone she met. She saw the best in all of us, even when we couldn't see it ourselves. Andrew was a bright young man taken from his friends and family too soon by suicide. He was a bright and caring young man who always loved helping out at conventions and was just a blast to be around. Andrew was a sweet heart and really cared about everyone and they returned that to him. The armor that he was working on was passed to another member by Andrews mother and his brother allowed us to take his helmet to Celebration for the Death March to honor him. Everyone loved him in the group and he will always be missed. 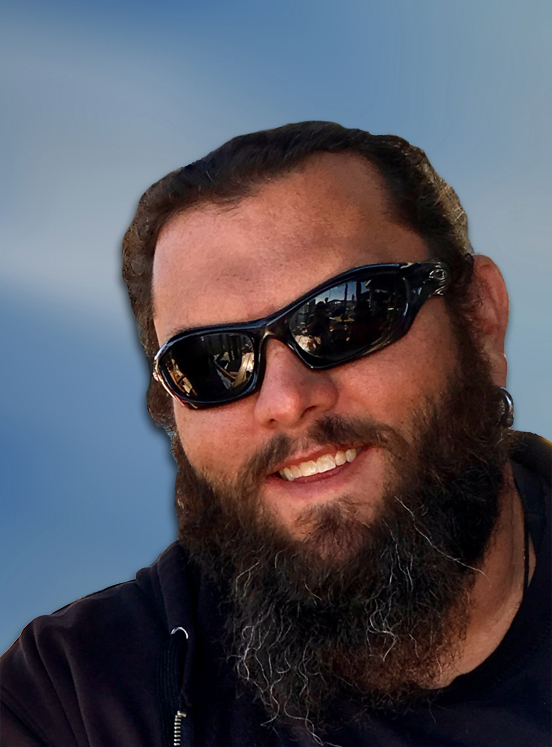 Julian "Ward" Godwin, III was an avid outdoorsman and gamer who left his mark on those who knew him. "His passion was limitless, and was most present in his advocation for those who suffered. He vowed to protect the bullied, the outcasts - those rejected, hurting, weak and lonely. With the strength of a mountain, he carried us all; he carries us still." 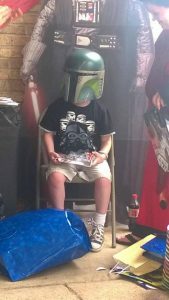 His local clan was assisting him in an attempt to become an Official Member by Celebration, which he had planned to attend. He was remembered during the Death March by members Tycho Villaz, Darman Kebii'Tra, and Tier who each wore a black chest diamond in his honor. 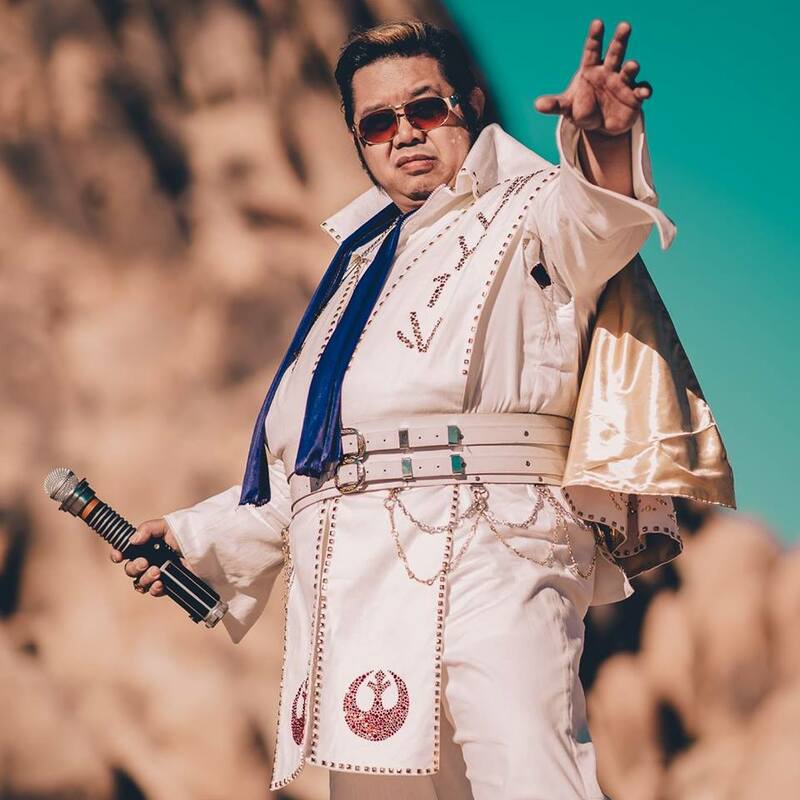 Whether you knew him as Chow Yun Fett, Jarkiv Vaird, Jaro Karr, Jedi Elvis, or his real world name of Eric Cajiuat, our Manda'galaar Clan vod always left an incredibly positive impression on you. 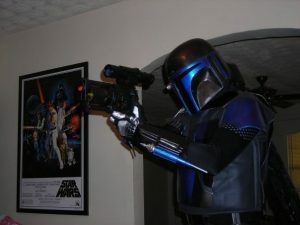 One of the founding members of the Manda'galaar Clan in Los Angeles, California, Eric was proud to be a costumer before costuming was "cool". He especially loved the way it brought together so many different people, from so many different backgrounds. He always believed that when people could come together over a love for just one thing, it would open the doors for people to discover so much about each other, and then truly see, we are not that different at all. Eric never turned away from doing an event that benefited children. Whether he was wearing his armor and posing for photos, or singing his heart out as Jedi Elvis, the children held a special place in his heart. He loved to be in character whenever he was in costume, and when children asked him questions, he always gave them an answer that sounded like it could have been from a Star Wars movie. In a world where people are quick to laugh at you, or make fun of you because your costume is not "quite right", Eric was a beacon of positive feedback and constant encouragement. While the world is truly a little less bright without him, he is not gone, but merely marching far away. BUCKETS OFF!!! For those that knew him Will Friedrichs aka Redkraytdragon passed away last night August 11th, 2017. Sadly Will has been battling cancer and cancer won. He was a great guy and everyone loved him. He was a maker of armor and Imperial Outpost Armory was his baby. 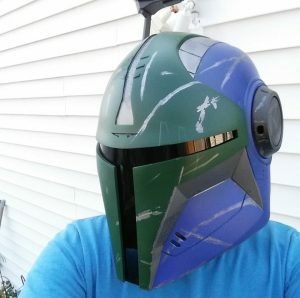 His Boba is what got him approved with the mercs and it's saddens us all to lose a fellow brother. For those who were close to him and his family our deepest condolences we are glad he is no longer in pain but very saddened that his life had to end this way. REST IN PEACE BROTHER and until we meet again OYA!!!! Known as Kyram Do'ruun, Jason lived in Michigan and was a founding member of Rancor Clan when it covered most of the Great Lakes states. When I put the call out 11 years ago for a Quartermaster, he stepped up and took the reigns. MMCC's first shirt run in 2007 was screen-printed personally by Jason, along with our first patch in 2008, and the "Generation 1" MMCC t-shirt that followed. Jason was both Quartermaster and Art Team for MMCC merchandise back then. Battling health issues for many years, Jason was able to troop for around 2 years before it just became too difficult for him to don the helmet. While I lost comms with Jason some years back, I never forgot him, and his dedication to MMCC in those early years. He has earned his place among our honored remembered. From the moment Christy joined Manda'galaar she has been a shining example of what it means to be a Merc. She is kind, funny, generous and welcoming. Christy fast became an example to others of what we aspire to be. She made members feel like family from day one, never had an unkind word to say and believed the goals of the Mandalorian Mercs were not just a club principle but a rule for every day life. She helped those around her become great and brought smiles to every face she met. She can never be replaced and will be missed by all of her family, friends and clan mates more than words can express. Oya, Christy! Aiden Bonner was diagnosed with an aggressive brain cancer on August 16, 2013. 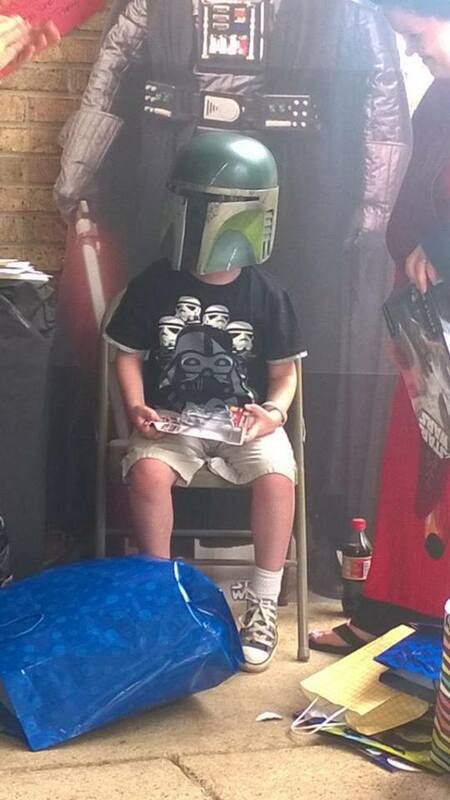 He loved Star Wars and in 2014 at a Star Wars themed birthday party was presented with his own Mandalorian helmet and made an honorary member of Veshok Clan. Aiden was a fighter who continued to smile through everything; he embodied the word verd'ika which means little warrior. Aiden is an inspiration and hero to all that knew him and Veshok Clan continues to attend events in his name and help spread awareness.